The SparkFun Wall Adapter Power Supply is awesome, because it has a regulated 9VDC output at 650mA and a red power LED. "Who cares and why I am reading this! ", you say? Well, let me divert from your question and give you some background. Not all wall power supplies, aka "wall warts" as they like to call themselves, are created equal. Some are born of meager proportions and are sometimes labeled as unregulated power supplies or "complete pieces of junk". When this type of power supply is given the right to your favorite embedded device, the output voltage can actually be higher than the rated voltage! In other words, they lie, cheat, and might not be nice to your electronics. 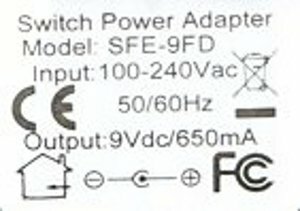 However, the SparkFun Wall Adapter Power Supply is made of geekier things and so has been given the prestigious distinction of switched mode power supply or "king of the power bricks". Not only will the output voltage read a clean 9VDC like the label says, the unit is smaller, lighter, more efficient, and plays nicer with your embedded electronics than the average unregulated power supply. Keep in mind, most microcontrollers run on voltages less than 9VDC, so the wall adapter power supply should be used along with a voltage regulator to power your embedded system. 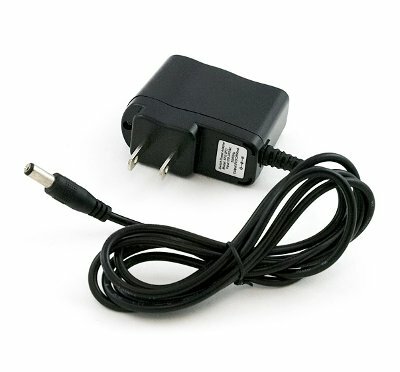 Input: 100-240VAC - Yes Europe, you are included, although you will need a plug adapter. Output: 9VDC at 650mA - Your system must not use more that 650mA.